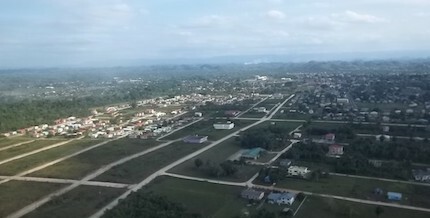 Belmopan, capital of the Central American country of Belize, is a relatively new city, having assumed premier city status in 1970, succeeding the centuries old former capital, Belize City. Belize was formerly the British Colony bearing the name, British Honduras. Belmopan is located 50 miles (80 km) inland from Belize City. It became the new capital city largely as a result of acts of nature. The city was conceived after Hurricane Hattie and an associated tidal wave did extensive damage to Belize City in 1961, demolishing approximately 75% of its housing and businesses. The Belmopan site was chosen far enough inland to avoid a recurrence of damage from coastal flooding. In 1962, a committee chose the site now known as Belmopan. Construction began in 1967 with funds from a United Kingdom grant. The first phase was completed in 1970. Belmopan is laid out around a Ring Road that encircles most of the city. It is 76 metres (250 ft.) above sea level, near the Belize River Valley, with an imposing view of the majestic Mountain Pine Ridge. The new capital is located on safer terrain and provides room for an industrial area. In 1970 government offices were moved to the new capital and housing construction continued through the 1970s. With approximately 20,000 residents, Belmopan is today the fastest growing population center in Belize. Once a sleepy town mainly populated by public employees, the city has rapidly expanded, primarily due to immigrants who have settled on the outskirts, and by an increasing number of Belizeans fleeing the congestion, dated infrastructure, and lack of land for housing in the old capital. Maya Mopan is an interesting new suburb formed in 2004 by a spontaneous migration of Mopan Maya and Ketchi Maya immigrants from the south and west of Belize. The city is significantly influenced by that ancient culture as the surrounding region was once a Mayan stronghold. Belmopan is one of the safest cities in Belize. It also has good road signage, pedestrian ramps, wide open green spaces, and a building code requiring all buildings to be constructed with concrete in order to reduce the danger of fires. Belize City, the former capital, had frequent devastating fires because almost all of the houses and minor buildings were wood and constructed closely together which made this a recurring peril. Because of its relatively young history, the city cannot yet boast of a legacy of historic attractions. What it does have is natural history through an extensive caving system. Belize is literally riddled with caves, many of them within easy reach of Belmopan. The George Price Centre for Peace & Development, named for the first Prime Minister of independent Belize (1981), provides the community with a library, as well as computer and meeting facilities. It is also home to traveling art and museum exhibits, concerts, dance recitals, and theater performances. http://www.belize.com/belmopan; http://www.frommers.com/destinations/belmopan/274557; Encyclopedia Britannica Online.